Are you a professional – mid career or at a senior level? Are you committed to working in organisations that are value driven or delivering social benefit? Are you looking to be more successful in your career? To do more? Be more? Deliver more for individuals and Communities? Are you seeking a firm direction? Unclear about your next career move? Are you struggling to make the move into a senior or executive role? Are you looking for support from someone who understands your world? your drivers and values? and all the hoops you may have to jump through? Do you want a more successful and fulfilling career? I offer career coaching, recruitment support and training in staff selection techniques based on my experience and best practice research to help you get the career you want. Mary Hope Career Success can help you achieve what you want in your career, whether it is immediate success in a recruitment process, or a more strategic approach to career management. 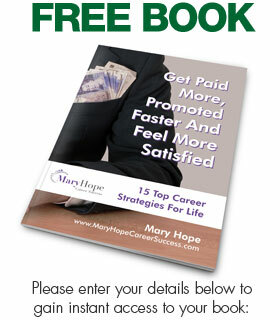 Send now for my free book and discover the answers of career success for today’s professional! No one else teaches career planning and how to be good at applications /interviews – but I know how it works and can share the recruiter’s secrets and methods. You can read lots of my articles here – that will help you decide if Mary Hope Career Success works for you! You have found a great website if you are wondering what is coaching or if are looking to find a career coach or you want specific career coaching, business coaching, interview coaching, professional coaching, management coaching, mentoring or coaching and mentoring, I can help you work out what you want and then get it!